These 400W home security floodlights are ideal for illuminating a wide area. Built-in PIR movement sensors mean that the lights automatically switch on when movement is detected. The movement detectors have a 180 degrees detection angle, and can be pointed in a range of directions through 180 degrees left to right and 180 degrees vertically. Each movement sensor has three adjustment settings to vary the sensitivity to movement distance, illumination time and daylight. The latter can be used to prevent the light illuminating during the day. The die-cast aluminium casings are both strong and lightweight, and are fronted with shatterproof glass. The casings are weatherproofed to IP44 standard. 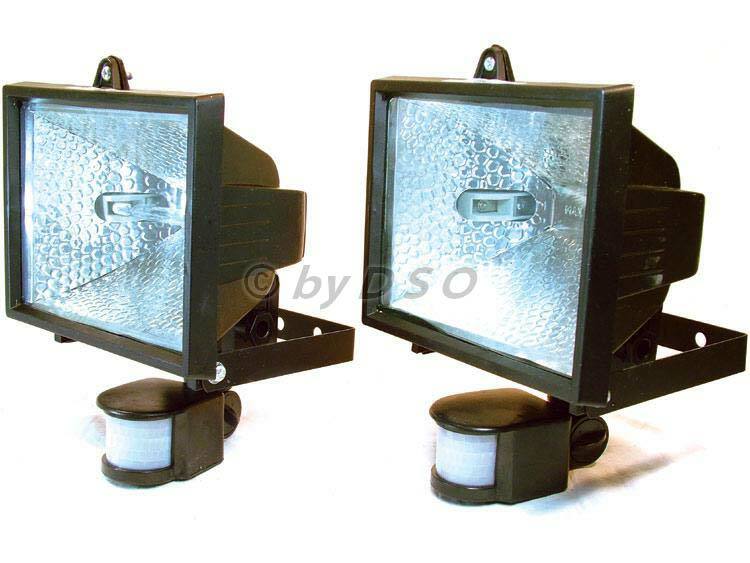 The halogen lights are supplied complete with mounting brackets and 400W halogen bulbs.